Safe, intuitive connectivity is important at Honda. Inside the 2018 Accord, you’ll notice all-new display interfaces including an ultra-slim 7-inch TFT LCD driver’s meter and a new 8-inch control interface with physical volume and tuning knobs. It features new and more intuitive, smartphone-like features and functionality including customizable app tiles and home-screen shortcuts, along with Apple CarPlay™ and Android Auto™ compatibility. 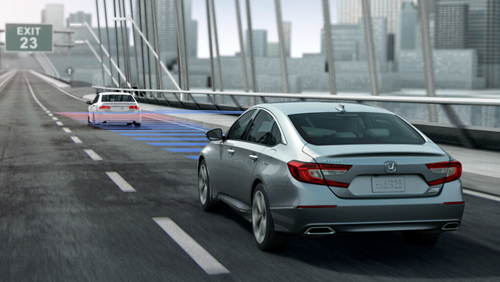 All Accord models also feature a Multi-Angle Rearview Camera with dynamic guidelines. This Accord also features the next-generation of HondaLink Subscription Services with new capabilities including automatic collision notification, emergency roadside assistance, remote locking/unlocking and engine start, stolen vehicle tracking, remote diagnostics, geofencing, speed tracking and more. 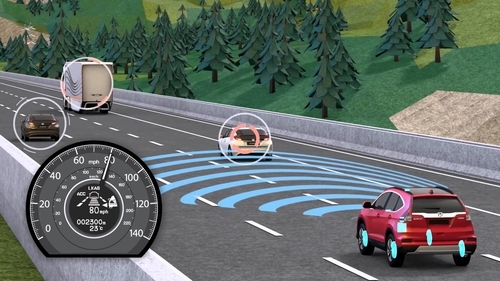 Lane Departure Warning (LDW) which can detect unindicated lane departures from detected lanes. Alerts will flash and sound to help bring your attention to correcting the lane drift. Lane Keeping Assist System (LKAS) knows if your vehicle begins to stray from the centre of a detected lane without signalling and adjusts the steering to help bring you back to the lane centre. Road Departure Mitigation System (RDM) detects if you are drifting too close to the side of the road without a turn signal activated. RDM then alerts you with rapid vibrations on the steering wheel and can provide mild steering input to help keep you on the road or apply braking to help keep you from going off it. Adaptive Cruise Control (ACC)* helps you maintain a safe, set following distance on the highway, so you don’t have to manually change your speed. Collision Mitigation Braking System™ (CMBS™) helps brake the vehicle when it senses an otherwise unavoidable collision with a vehicle detected in front of you. Forward Collision Warning (FCW) uses a camera mounted above the front windshield to detect vehicles in front of you. If you are at risk of a collision with a detected vehicle, it activates audio and visual alerts to warn you or even automatically apply brake pressure. Honda LaneWatch™ uses the camera on the passenger-side mirrors to turn on and display live video on your Display Audio Touch-Screen, revealing nearly four times more than the average passenger-side mirror. Other advanced active and passive safety systems available include Auto High Beam Headlights, Blind Spot Information System, Cross Traffic Monitor, Vehicle Stability Assist with Traction Control, Anti-lock brakes with Electronic Brake Distribution, Tire Pressure Monitoring System (TPMS), dual-stage multi-threshold front airbags, driver and front-passenger side airbags and new driver and front-passenger knee airbags. It’s an impressive list of features. So, if a new mid-sized sedan is in your future, call to reserve a test drive today. Make sure it’s a long one so you have a chance to review all of the safety and driver assist technologies that could be working to keep you safe in your 2018 Honda Accord.